Temple Law student Jasper Katz is doing exactly what they came to law school to do – and they’re making an impact. The rising 3L has been recognized for their service to the transgender community with both an Equal Justice Works Regional Public Interest award and the David Rosenblum award, given by the LGBT Rights Committee of the Philadelphia Bar Association. Katz wasted no time getting to work. 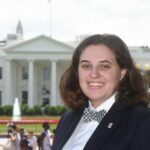 In their first year of law school, Katz collaborated with another student, Cameron Redfern, to create and lead a training for Temple Law students on gender identity and sexual orientation, providing more than 100 students with the information they needed to better support the transgender people in their lives. The training was extraordinarily well-received; so much so that as 2Ls, Katz and Redfern presented “Gender 101” to Temple Law School faculty and staff, which included a conversation about how law faculty can best support transgender students in their classes. Katz has also focused much of the experiential component of their legal education on issues facing the transgender community. As a Law and Public Policy Scholar, they worked as an EJW Americorps Fellow at Whitman-Walker in Washington, D.C., providing assistance with name changes, gender marker updates, and immigration issues to transgender people. They also produced a white paper, Can I See Some ID? : The Importance of Self-Attestation for Transgender, Gender Non-Conforming, and Non-Binary People, and have been invited to present that paper at the annual meeting of the Law and Society Association in Toronto. The paper addresses the emotional and legal importance of allowing transgender people to report their gender identity on identification documents without third-party verification.